Formal restraint, structural clarity and great seating comfort are convincing features of the chairs in the Visavis product group. Several different versions are available, making the chairs suitable for diverse applications, ranging from contract and mass seating to home furnishings. Visavis chairs are ideal companion pieces to the office chairs in the Citterio Collection. The version with a padded and upholstered backrest offers additional comfort, has a neutral appearance and, with its variety of Upholstery Colours and colours, can be used to accentuate an interior. This cantilevered chair is extremely comfortable, thanks to the shape and construction of its tubular steel frame. The free suspension of the seat allows it to respond to the user's movements with springy resilience. The backrest is made of flexible plastic with integrated armrests. Due to its innovative construction, it not only provides solid support to the spine, but also allows a high degree of mobility. Perforations in the surface ensure constant air circulation. These are not simply aesthetic features, but essential elements of comfort. In addition the chair is available in a wide selection of upholstery materials, colours and surface textures. For use in training venues and for mass seating in auditoriums and other large spaces Visavis and Visavis 2 are available in stackable versions and optional writing tablets. 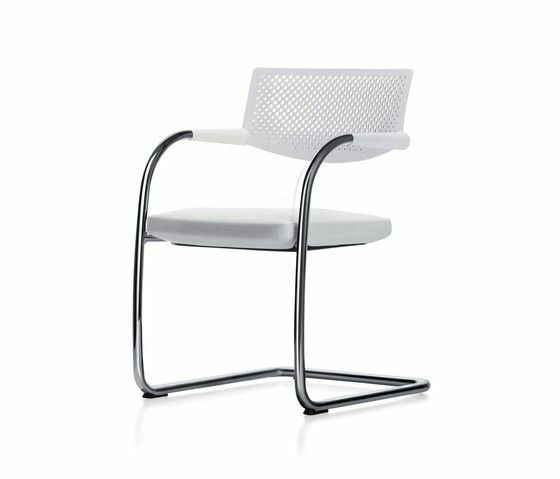 Visavis 2 is distinguished by its slender backrest construction with a fine pattern of circular perforations. Technical Cantilevered base made of tubular steel (matte or polished chrome, or surface coating in the colour basic dark). Fabric or leather seat cover over a polyurethane pad. Backrest with integrated armrests made of polypropylene in the colours basic dark or transparent; backrest versions either un-upholstered, or upholstered with a cover choice of fabric or leather. Base on plastic glides, optional felt inlays for hard flooring. Chromeplated base also available for stacking version (5 chairs max.) or with row connectors. Optional writing tablet. Plastic backrest with integrated polyamide armrests, basic dark or soft light. Back with round perforations in a grid pattern. Polyurethane seat cushion. Covers in fabric or in leather with double seams on a flat seat cushion. Tubular steel, powder-coated in basic dark or chrome-plated with polished finish. Bases with a polished chrome finish are also available in a stackable version (max. 5 chairs).